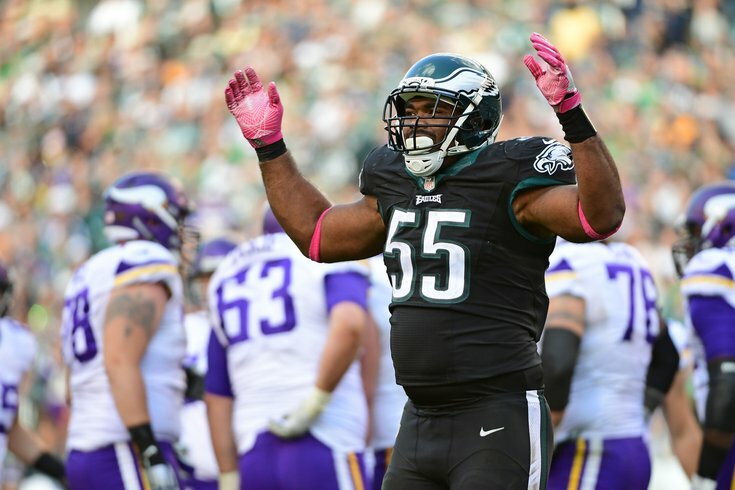 Brandon Graham should have a favorable matchup next weekend. While the strength of the Minnesota Vikings' team is very clearly their No. 1-ranked defense, they also have a formidable offense that ranked 11th in the NFL in yards, and 10th in points. Earlier today, we listed five matchups to watch when the Eagles have the ball. Here we'll note five matchups to watch when the Vikings have it. During the regular season, the Vikings had the fourth highest run:pass ratio in the NFL, as they ran it on 47.1 percent of their plays. The four "other" teams on the list above have quarterbacks who ran significantly more than Case Keenum did this year, meaning that those teams' run:pass ratio numbers are a little skewed. The Vikings were second in total rushes, with 501. A week ago, Jim Schwartz noted that the duo of Devonta Freeman and Tevin Coleman were kind of like an All-Pro back if you combined them into one guy. He tried to make the same argument for the Vikings' running backs this week. "I made a big deal last week about if you combine the running back totals how it would be an All-Pro player," said Schwartz. "These guys aren't that far off it." All season long, Vikings observers have waited for quarterback Case Keenum to falter, and there's maybe an argument to be made that the Vikings themselves have as well, based on their insistence on hammering the run, despite average production. The Eagles must force the Vikings out of their comfort zone by shutting down the run game. In our five matchups to watch when the Eagles have the ball, we noted that a tough matchup for the Eagles will be Halapoulivaati Vaitai vs. Everson Griffen. Assuming the Vikings roll out the same OL look on Sunday, the potentially lopsided matchup when the Vikings have the ball could be Graham vs. Hill. Hill has been in the league for two years. He signed with the Jaguars as an undrafted free agent in 2016, and was signed off their practice squad by the Vikings after Minny had a spate of injuries along their OL. Hill appeared in one game last year, and 11 in 2017, starting 7. In the same way Doug Pederson is likely to give Vaitai a lot of help against Griffin, expect the same from Pat Shurmur in the matchup between Graham and Hill. When Graham gets one on one opportunities, he must take advantage. A week ago, the biggest mismatch advantage for the Eagles was their defensive tackles against the Falcons' guards, and Fletcher Cox came through in a big way. "He was hard to handle in the run game," said Schwartz. "A lot is made of Fletch in the pass game and rightfully so, he's a good pass rusher. He made a couple plays in the run game that were big time. He also made some plays chasing some wide-receiver screens, and Fletch is a great athlete. He's got speed. He's done that since he's been here, though. I think it just was probably on a little bigger stage and it got a little bit more attention. He's played good, consistent ball all year." Cox is the Eagles' $100-plus million man, and he played like one last weekend. That must continue against the Vikings, who are similarly challenged as Atlanta along the interior of their OL. As noted above, Remmers had to move from RT to LG, so the Vikings lack continuity to some degree on the left side of their line. Additionally, rookie third-round pick Pat Elflein has struggled at times this season, while RG Joe Berger is sort of "just a guy." It's perhaps also worth noting that when the Vikings throw it, they do not get the ball out quickly. On the season, on average, Keenum got the ball out in 2.78 seconds, according to the NFL's Next Gen stats. That was the ninth-slowest in the NFL. He held onto the ball longer on average than Carson Wentz, who was not afraid to led routes develop down the field. In other words, the Eagles aren't facing an offense like the Giants', where they try to protect their offensive line by getting the ball out in two seconds or less. The Eagles will get pass rush opportunities. The interior of the Eagles' defensive line must find a way to push the pocket and get in the face of the 6'1 Keenum. The strength of the Vikings' offense is their pair of receivers in Adam Thielen (91-1276-4) and Stefon Diggs (64-849-8). Both receivers are capable of making big plays. On the season, Thielen had 20 receptions of 20-plus yards. That was tied for fifth in the NFL. Diggs had 14. By comparison, on an offense in which Carson Wentz was more than willing to air it out, Nelson Agholor led the Eagles with nine receptions of 20-plus yards. The trio of Ronald Darby, Jalen Mills, and Patrick Robinson must do a good job of tackling and limiting yards after the catch. On the season, Keenum was a much more effective quarterback indoors than he was outdoors. The weather forecast for Sunday is a high of 51, low of 37, with winds of 10 MPH. Count on game-time temps to be a little north of 40 degrees. That's nicer weather than what the Falcons walked into a week ago, but it's still less appealing than playing in a dome. Keenum played for three years in Houston (dome), then one in St. Louis (dome), then one in Los Angeles (it's kinda nice there), and finally, one in Minnesota (dome). Oh, and I'm fairly confident that Keenum has never played in an opposing stadium that will be as jacked up as Lincoln Financial Field will be on Sunday.